It is our hard work and determination to make every surface shine that has made Haugland Brothers the premier cleaning company in Hinsdale. Haugland Brothers Carpet & Floor Care is a full service surface cleaning company that takes pride in our work. With an eye for details, we intricately deep clean shower stalls and tubs, removing all traces of dirt, mold, and mildew. You will be shocked at the difference in the way your shower looks and smells once our team get their hands on it. Working in the Chicago area, Haugland Brothers has a solid reputation for being efficient, competitively priced, and reliable. With no job being too big to tackle or too small for attention, we are pleased to be invited into dozens of Chicago communities. With Haugland Brothers you get a full service cleaning company that is fully equipped to take on every phase of the project. We prepare, clean, and protect quickly and effectively, with very little disruption to your normal routine. With a commitment to excellence that cannot be matched, our main objective is your complete satisfaction. How Healthy is Your Shower? Mold and mildew is not only ugly to look at, it is unhealthy to breathe. A shower and bathroom that has been over run with this black and green menace is destroying the breathing air in your entire home. Once spores break off they enter the heating and cooling system to re-circulate through your home, exposing you and your family to infection. Make Your Shower Look Like New Again! With steam and specialized sanitizing solutions, bacteria, and germs are killed on the spot inside of shower stalls. Built up mold and mildew is also blasted away, leaving behind a sparkling clean, fresh shower. Streaks and soap stains on the tiles are removed with care, leaving behind a smooth clean surface that looks brand new. The grout that holds the tiles in place is of special concern, as it is made of a porous material. Although many are sealed, those seals often break down, staining the grout underneath. The expert cleaning service of Haugland Brothers will remove those stains, and restore the color. Sealant can then be reapplied to protect the grout until the next deep clean. 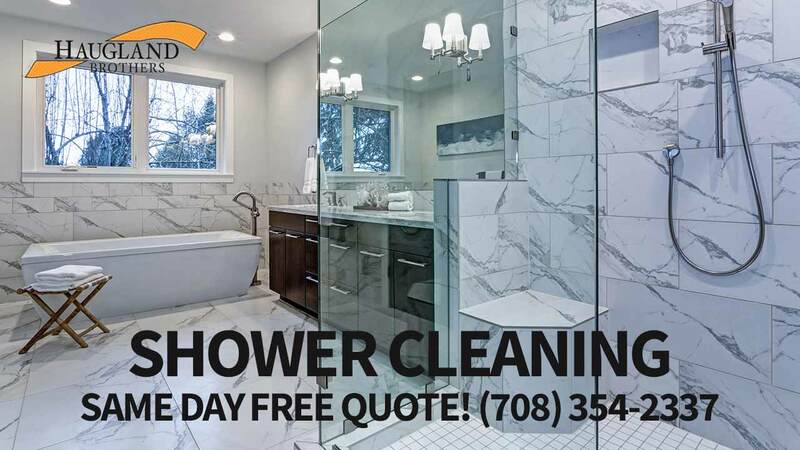 Why Should You Have Your Shower Stalls Cleaned Professionally? The environment inside of a bathroom presents the perfect opportunity for the growth of mold and mildew. Using the chemical containing cleaners sold in stores may actually make it worse by breaking down the sealant and allowing mold to penetrate the grout. Without the professional help of Haugland Brothers Carpet & Floor Care, that mold may continue to grow, possibly compromising the wall behind your shower stall. Only a thorough deep cleaning from a professional team of experts will remove all traces of mildew and mold and protect the integrity of your bathroom walls. With precision, we get into every inch of the tiles and grout, even those hidden by your shower fixtures. By cleaning the shower professionally, you are extending the life of the tiles and tile work. This is a job that requires great care and attention to detail. Things you are not going to find with any other company in Chicago. Haugland Brothers takes the time to make sure that the construction of your shower stall has not been compromised by mold and mildew. How Often Should You Have Your Shower Cleaned Professionally? This depends on a lot on your home. Bathrooms that have adequate ventilation fans or windows that can be opened may be able to go months before a professional cleaning from Haugland Brothers, while small bathrooms in a house where the humidity is high may need attention much sooner. Once you can see black staining inside the grout between the tiles, it is time to give us a call. The longer you wait for a deep and thorough cleaning of the bathroom tiles, the more likely that toxic mold is invading your entire home. Don’t take any chances with mold and mildew in the shower, call on our team ASAP! What Can You Do to Protect Your Shower Stall in Between Professional Cleanings? Using mild soaps on the tile and grout in between professional cleanings will help to keep your shower looking clean and feeling fresh. Be cautious with harsh chemicals that break down the grout. Rinse it well when finished to try and eliminate any streaking on the tiles. The best thing you can do to slow the growth of mold and mildew is ensure that your ventilation fan is always on when the shower is in use. This will pull moisture out of the bathroom to the outside, taking away the environment that molds thrive in. How Important is Grout Sealing? Grout is made from porous compounds that will allow moisture through. If left unsealed, you are risking damage to the wall behind the shower as well as encouraging mold. After every professional shower cleaning, you should have that grout re-sealed for maximum protection. Achieve a sparkling clean shower that glows from top to bottom with the pristine cleaning services that only Haugland Brothers provides. If you want the cleanest results, we are the premier cleaning company to call! Call (708) 354-2337 today!